Dark Horse | Beer Apprentice - Craft Beer News, Reviews, Interviews and Info. How’s it going everyone? I hope all is well in the better beer world for ya. For today’s craft beer review I’m going to be trying the Ginger In Your Pants produced by the Dark Horse Brewing Company located in Marshall, Michigan. I’ve got to give a big thanks to Mr. Liquid Bread (http://mrliquidbread.wix.com/mrliquidbread) for sending this brew to me. Be sure to check out his beer reviews sometime if you get the chance. This brew is somewhat rare, so I couldn’t find any info about it on their website, darkhorsebrewery.com, however journey over there to read about some of the other beers they produce. This was bottle #394 out of 396 produced and it was from batch #3945. This beer came in a 25.4 oz. bottle, yet I have no idea what the ABV is. It poured a fairly clear, deep ruby/red color. The cap was off white, smooth and semi-creamy. It was sized very well and the retention time was way better than average. The lacing was thick and clingy too. It was a very, very nice looking beer in my opinion. The aroma released hints of ginger spice and light caramel. A relatively strong tone of cinnamon was accounted for, which was followed by an underlying breadiness. This thing kind of smelled like those “Red Hot” candies to be honest. A little bit different, but not bad. The taste was somewhat sugary with a touch of cinnamon and alcohol. It had a ginger snap cookie kind of flavor also. Semi-toasted breads or bread crusts added some roundess toward the end. That’s about all I got actually. The mouthfeel was medium bodied. Smooth, somewhat crisp and mostly dry. A good amount of carbonation was to be had and a small amount of warmth was felt from the combination of the cinnamon and alcohol. A nice shot of flavor was left behind after each sip as well. Well, this was an ok beer. I had heard some bad things about it, but I didn’t think it was nearly as bad as some others had made it out to be. I’m better off having tried it that’s for sure. 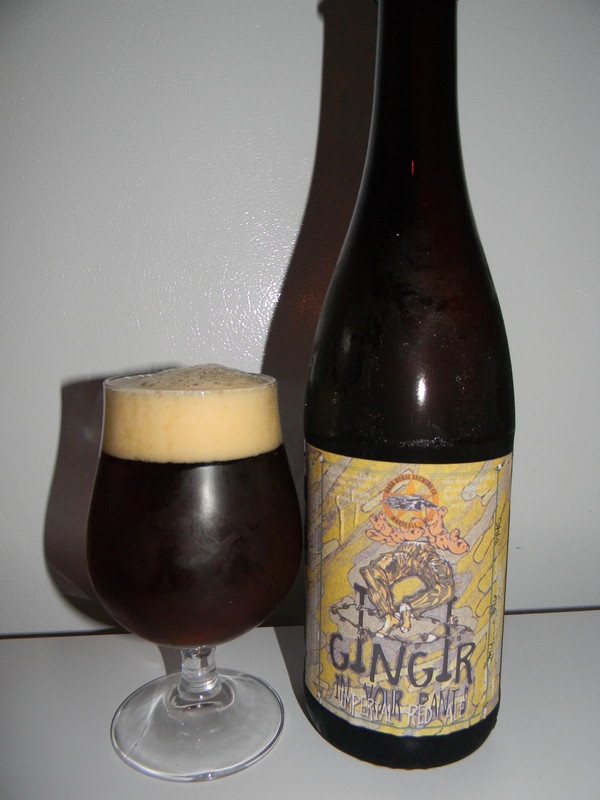 A lot of other reviews stated that the ginger was too overpowering. Maybe the ginger had subsided with this bottle. The drinkability wasn’t bad and it had some decent characteristics in my opinion. Either way, if you can find it, the Dark Horse Ginger In Your Pants would be worth a try just for the sheer rarity of it. Again, I have to give a big thanks to Mr. Liquid Bread for hooking a brother up. Hello everyone. For today’s craft beer review I’m going to be trying a Double Crooked Tree produced by the Dark Horse Brewing Company located in Marshall, Michigan. Thanks to Mr. Liquid Bread (http://www.youtube.com/channel/UCJjfCy8SDPNzifP5MMdRWJQ/videos) for hooking me up with some of these tasty Michigan brews. Let’s get to the website, darkhorsebrewery.com, for the commercial description of the Double Crooked Tree. Have you read the description for the regular Crooked Tree yet? Well this beer is almost the same just double the flavor and alcohol. We actually took the Crooked Tree recipe and doubled all of the ingredients except the water, just the way a DOUBLE should be made. Big hops balanced with tons of malt give this beer a huge body. Although this beer is as cool as “The Fonz” when first purchased, it gets really mellow and smooth with some age. After a year or two stored in a cool dark place you’ll notice the heavy caramel and malt flavors are trying to sneak past the hops. This beer is hugely delicious so it will need your undivided attention (the chores can wait….trust us). This beer comes in a 12 oz. bottle with an ABV of 13.6%. 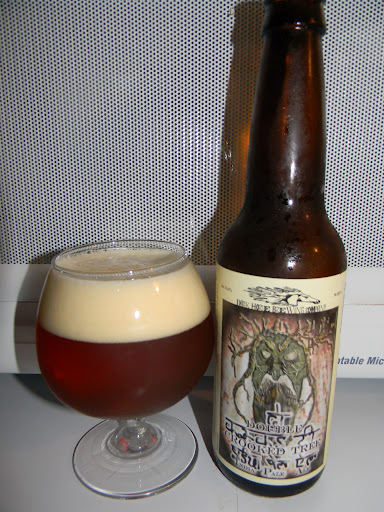 It poured a relatively clear, dark orange to amber color with an off white head of very good size. It was generally smooth and creamy. The retention time was outstanding and the lacing was very thick and very clingy. A great dose of clear alcohol was left on the sides of the snifter when I tilted the beer from side to side. I thought this was a gorgeous looking liquid. Then nose was very dank, resiny and piny. The citrus was a little bit lower than expected, but I was able to pick out a note or two of pineapple. It smelled a little bit sweet and malty too. Rather rich and robust I thought, however I didn’t find as much alcohol in the nose as I thought I might considering the higher than normal ABV. The taste was, again, quite dank, resiny and syrupy. The alcohol definitely steps it up a notch within the taste. A lot of sweet caramel malt too. The flavor is big, rich and robust. It’s substantially bitter of course, however I still didn’t get a whole lot of citrus or anything. Just a little smidgen of pineapple to be honest. Pretty darn tasty though. The mouthfeel was medium to full bodied. Very dry, sticky, chewy and smooth. The carbonation was a bit lower, which I found a somewhat confusing considering the awesome retention of the crown. A noticeable warmth was felt across the entire palate and into the belly plus a good deal of flavor was left behind after each swallow. Well, I think we have a very nice beer here. It is kind of “big”, but the drinkability was still totally manageable considering. It became way more enjoyable and refined as it opened up and was allowed to warm a touch. I really started to like and appreciate it the longer I sipped. It would definitely be worth a try if you guys can obtain it. I think it would be a great Winter warmer to be honest. One to just kick back and contemplate on a cool evening. Once more, I want to thank Mr. Liquid Bread (Chris Phillips) for the chance to sample this brew. Be sure to check out his entertaining beer reviews if you have a few extra minutes. Thanks for reading everyone and don’t be afraid to leave a comment if you have a suggestion or question. I really enjoy the interaction.